Statement of purpose: FM’s objective is to promote, support, protect, and expand the collecting of mineral specimens, while furthering the recognition of the scientific, economic, and aesthetic value of minerals and mineral collecting. The purpose of the symposium is to bring together professional and amateur mineral enthusiasts to share information of common interest, to build a local mineralogical community and to provide students with an opportunity to share their work and receive public recognition for it. Dr. Steve Chamberlain is the Coordinator, Center for Mineralogy, at New York State Museum. He is a prolific collector of New York state minerals. Steve was chairman or co-chairman of the Rochester Mineralogical Symposium from 1986 to 2018. Dr. John Medici is an American Chemical Society emeritus Chemical Abstracts retiree (Biochemistry/Food/Nutrition editor-translator) with extensive field collecting travels in over half of the 50 US states and several provinces in Canada. Dr. Ken Bladh is President, Friends of Mineralogy Midwest Chapter. He is Emeritus Professor of Geology at Wittenberg University and editor of the MSA Handbook of Mineralogy. Dr. Claire McLeod is an Assistant Professor of Petrology and Geochemistry at Miami University. Her research involves looking at the mineralogical make up of returned Apollo samples and lunar meteorites in order to evaluate the geological history of the Moon. Dr. John Rakovan is a Professor of Mineralogy at Miami University and an executive editor of Rocks & Minerals. 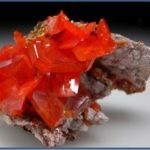 ADDITIONAL PRESENTATIONS by KEYNOTE SPEAKER: Dr. Steve Chamberlain will be giving an additional talk at the Cincinnati Mineral Society meeting on the evening of Friday, March 8, 2019. Contact Terry Huizing at tehuizing@fuse.net for further details or visit the CMS website (mineralsociety.org). DIRECTIONS and PARKING: The Limper Geology Museum is located on the Miami University campus just inside the East and West entrances to Shideler Hall on the first floor. Shideler Hall is located west of the intersection of US Highway 27 and State Route 73. See map on following page. Recommended parking is in Cook Field lot near the bell tower across the road from Shideler Hall. Parking requires the purchase of a permit. Please visit http://www.miamioh.edu/parking/permits/index.html, select Visitors, and then click Purchase Visitor Permit. You will need to display this permit on your dashboard the day of the event. Cost is $3. You may also obtain permits from John Rakovan inside the auditorium on the day of the symposium. You will need cash. You will have to walk back to your vehicle to display the permit. It is once again time to take MSHA refresher training so that you can participate on all of this year’s upcoming field trips. Scott Kell will be giving his collector-specific training on Saturday, March 23, from 9:00 AM -2:00 PM in the Barbara Deer Kuss Science Center at Wittenberg University, Springfield, Ohio. If you are using your GPS, the street address is 315 Bill Edwards Drive, Springfield, OH. Parking is available directly across the street from the Science Center. Signs will be posted on the doors of the Science Center to guide you regardless of what door you come in. I have been told by our host, Ken Bladh, that we are one floor up in a smaller room (holds 50) this year. The Dayton Gem & Mineral Society and Cincinnati Mineral Society are welcome to participate. I am asking the folks on cc: to please distribute this email to their memberships. Coffee will be available. Please consider bringing some snacks/drinks for yourself and others to enjoy. WE ARE NOT BREAKING FOR LUNCH so please come prepared for this if you cannot wait for food. This event is free. Students are welcome to attend. Most quarries do not let people under 18 into them. To make it easy to keep track of who attends and get certified, I would ask that you please respond to this at vpprograms@fommidwest.org and let us know if you do plan to attend.